One of the great things about my husband is that he is sort of a dandy; he can dress well and has an eye for design, generally speaking. He wouldn’t be caught dead in cargo shorts (or any shorts for that matter) and he can’t stand furniture that looks like it belongs in a dorm room. We have pretty similar taste, but unfortunately, it tends to be an expensive taste. He wants the books off the floor as well. Most people think it looks cool, but it is driving him crazy. So, I’m in the process of freaking out about what I can sort of afford and yet not be stuck buying cheap stuff — again. Buying a couch is my first world problem stresser right now. I always feel like if I buy a heavy piece of furniture, something will happen where I have to move suddenly. Then I think about how the cats will destroy it. The cats are really why I can’t buy nice things. Damn cats. First things first is we decided we are getting this rug, no question! Initially he wanted this union jack loveseat, but I know the velvet fabric will be a problem to maintain, and I think it will engulf the room. I mean, aside from zebra what the heck kind of rug would even compliment it? I may make a trip down to Parma to go over some of the newer furniture left at the furniture bank, but I don’t think I can stomach a used couch again. I won’t even begin to go into the ways I tried to salvage the infamous Alternative Press velvet couch that passed through at least 3 owners. I tightened the springs and re-stuffed the foam in the seat cushions. It was all futile. But then I come across something like this, and also have found that I can order a custom mid century mod sofa from www.FunkySofa.com with jaguar print or faux black crocodile. Uuuugh. Both options out of my budget but then again, will it be worth it? And now, I think we finally decided on this because the legs match my dining room set… but it is a bit too long. I have gone through every dang mid century modern sofa list on Pinterest, Apartment Therapy, RetroRenovation and more that I think I could find when trying to get something under $1,000. The site Design Within Reach? So not within my reach. Some places a good looking couch might have looked decent in photos but had really bad reviews, some shot up in price if you wanted a different color, some were just no longer available. I really don’t want to go through Ebay, either. I want something new new new. So if you have any suggestions or resources, leave it in the comments because I’m having a hard time pulling the trigger on anything right now! First World Problems, I get it. What about the ‘Garbo’ sofa???? So you. although the seat and back are that (aaaggghhh) almost ‘avocado’ green and naugahyde-type material. I couldn’t bring myself to heave it cuz it’s so perfect and I know there are alot of people who like mid-century modern. But I grew up with it EVERYWHERE so I’m kind of burnt out on it. P.S. You looked FABULOUS in the P.D. pic that ran yesterday. 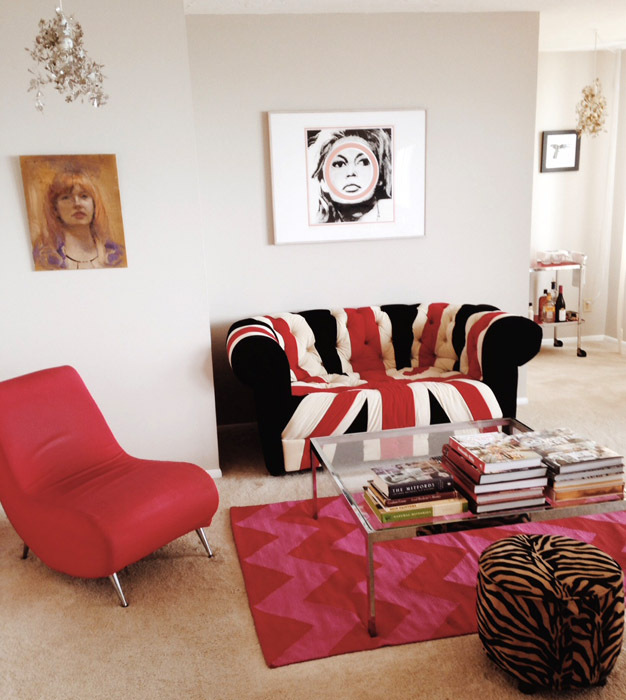 Welp, the man wanted the Union Jack so it’s what we got (and the rug too). I wanted the yellow one because the legs match the dining room set and the shape is good, but he thought it too long, and expensive. I won’t ever go to Suite Lorain after the court ordered damages the current owner has to pay to the former one (who is a friend). Never, ever!